from the dome of the Vatican. Check out other great photos every Friday at Delicious Baby.com. Wow. Just wow. 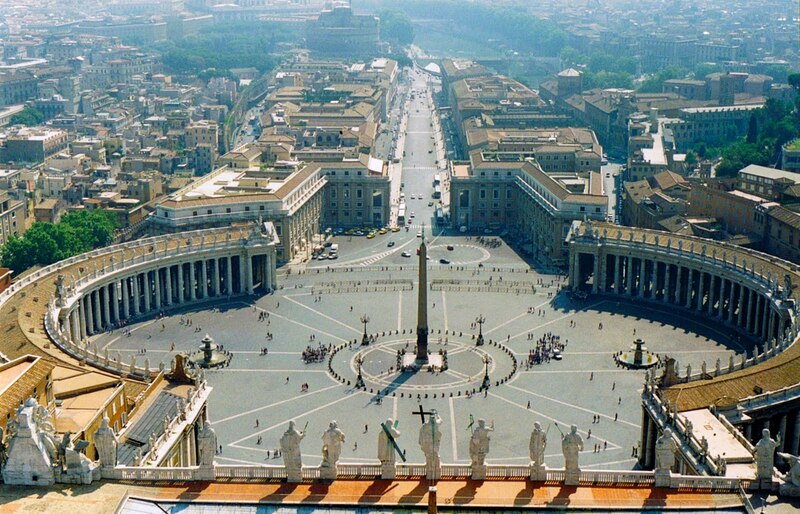 Vatican City is on my bucket list. One day! Wow!! Love the shot. I can't wait to take my kids there. I have visit the Vatican City when I was single. Amazing experience. Great shot! One of my boys (looking over my shoulder) said, "oh look mom its the arms scooping all the people in." I guess they do remember some things. Man, crazy to say that I have been there TWICE...actually saw Pope Benedict speak from the infamous window on St. Peter and Paul Day 2006. It's an amazing place to stand. Very cool! An amazing achievement in architecture. I love seeing the patterns from the high vantage point. Such a great view! The Vatican was closed the one day I spent in Rome... while I was incredibly disappointed, it just means I have to go back (who only visits Rome for one day anyway?!?!) Thanks for sharing! What an AWESOME photo...Really nice.